And if the child you’re thinking about purchasing this for is older then 3 but puts thinks in their mouths, it’s probably not the best gaming system for them either. The world's most intelligent talking globe, the Explorer II by LeapFrog contains thousands of facts about the world and fun games to help your children learn. They can play alone or with family and friends as they learn about the continents, countries, states and more . From flying time between locations to national anthems and currencies, kids will love learning about their world while playing 6 fun games at 3 different skill levels. 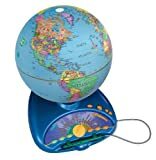 Includes retractable magic pen, volume control and world clock to tell the time and day of the week. Imported. 14Hx10Wx12D". LeapFrog® Explorer Smart Globe 4.3 out of 5 based on 193 ratings.